You switched to our site for Malaysia. This webinar provides the background to IP secure connections and introduces a test solution that makes it possible to identify vulnerabilities in the IP connection. This webinar explains the basic principles of envelope tracking and the test challenges involved in this technology. Rohde & Schwarz presented the most compact solution for mobile device production testing at the GSMA Mobile World Congress 2016 in Barcelona. Rohde & Schwarz demonstrated complete location based services as well as PQA test coverage from R&D, carrier acceptance through conformance at the GSMA Mobile World Congress 2016 in Barcelona. Rohde & Schwarz presented the R&S®CMW100 multi-device communications manufacturing test set at the GSMA Mobile World Congress 2016 in Barcelona. Rohde & Schwarz presented smart network emulation for all state-of-the-art mobile device tests at the GSMA Mobile World Congress 2016 in Barcelona. Rohde & Schwarz presented an automated solution for reliable and reproducible end-to-end conformance testing of eCall and ERA-Glonass modules at the GSMA Mobile World Congress 2015 in Barcelona. Rohde & Schwarz presented the R&S®CMWrun sequencer software, the automation tool for the R&S®CMW500 wideband radio communication tester, at the GSMA Mobile World Congress 2015 in Barcelona. Simplified power amplifier (PA) characterization including envelope tracking and digital predistortion has been demonstrated by Rohde & Schwarz at the GSMA Mobile World Congress 2015 in Barcelona. Rohde & Schwarz presented the new indoor mapping option for network operators at the GSMA Mobile World Congress 2015 in Barcelona. The new R&S®TSMA mobile network scanner has been showcased by Rohde & Schwarz at the GSMA Mobile World Congress 2015 in Barcelona. SwissQual, a Rohde & Schwarz company, presented smartphone-based video streaming testing including video MOS with its QualiPoc Android at the GSMA Mobile World Congress 2015 in Barcelona. Rohde & Schwarz presented the new R&S®CMWS advanced RF switch matrix, a multiport frontend extension for the R&S®CMW500, at the GSMA Mobile World Congress 2014 in Barcelona. The most versatile and easy envelope tracking test solution has been demonstrated by Rohde & Schwarz at the GSMA Mobile World Congress 2014 in Barcelona. Rohde & Schwarz presented handheld interference hunting for network operators at the GSMA Mobile World Congress 2014 in Barcelona. The new ultracompact R&S®TSME drive test scanner has been showcased by Rohde & Schwarz at the GSMA Mobile World Congress 2014 in Barcelona. SwissQual, a Rohde & Schwarz company, presented the QualiPoc Freerider II at the GSMA Mobile World Congress 2014 in Barcelona. This webinar provides insights into the underlying key technologies of the eCall system, highlights the test requirements and demonstrates powerful test solutions for the verification of eCall modems to ensure standard-compliant operation. This webinar will illustrate the implication of applications installed on a smartphone or tablet PC in terms of number of IP connections, list of protocols including protocol name resolution, TCP performance and data volume statistics. Rohde & Schwarz presented the most compact test system for mobile wireless location-based services at the GSMA Mobile World Congress 2013 in Barcelona. Rohde & Schwarz presented the first single box test platform for WLAN offloading, as well as for in-device coexistence tests at the GSMA Mobile World Congress 2013 in Barcelona. Equipped with an internal fader the R&S®CMW500 wideband radio communication tester now combines base station and channel emulation in one box. Rohde & Schwarz presented the new R&S®CMWcards user interface for the R&S®CMW500 wideband radio communication tester at the GSMA Mobile World Congress 2013 in Barcelona. 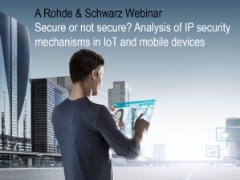 Rohde & Schwarz presented world's first integrated end-to-end test solution with IP analysis and protocol statistics for detailed assessment of data transmission on smartphones and tablet PCs at the GSMA Mobile World Congress 2013 in Barcelona. Rohde & Schwarz demonstrated data application testing on HSPA+ dual carrier 3GPP Rel. 8, CAT24 at the Mobile World Congress 2012 in Barcelona.